These are cookbooks that our great-great grandmothers would have used 100 years ago. During the Great War, as it was called back then, certain foods were in short supply so the government made an appeal to homemakers across the nation to conserve these foods and to make use of other foods which were more abundant. America sent a lot of foods overseas to our allies, and also had to keep soldiers well fed. This meant there were fewer foodstuffs available to the American consumer. 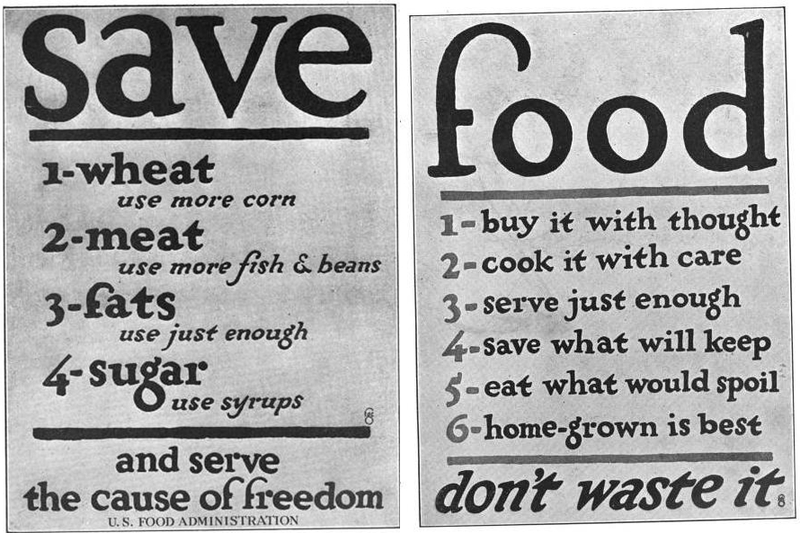 Rationing was eventually necessary, to make sure that these foods were divided equally among the populace. The main items in short supply were as follows. Instead of Wheat, people were encouraged to use rye, corn, barley, rice and potatoes. This caused a rise in price for these products, especially potatoes. Before America joined the war, in 1914, a pound of potatoes could be purchased for 0.019¢, that is less than 2¢ a pound. By 1916, potatoes cost 0.035¢, or 3-1/2¢ per pound. Their price nearly doubled in 2-years. Economy became a necessity for people who had never had reason to consider it previously. Instead of sugar, people were encouraged to use honey, corn syrup, molasses, sorghum and maple syrup. All meat fats, from beef, pork, chicken and even mutton, were saved and used for frying. Chicken fat was praised for it’s mild flavor and was often used in baked goods, including cake. Deep frying was frowned upon, even when the fat was saved and reused. The vegetarian movement, which had become increasingly mainstream during the early part of the century, was embraced by even dyed-in-the-wool meat eaters as a form of patriotism. Legumes and pulses, including peas, beans and lentils were an affordable, familiar and nutritious substitute. Cottage cheese and milk were also highlighted for their affordability and high protein content. Commercially canned goods were rationed because of the tin used in their production. Everyone was encouraged to plant their own Victory Garden. Growing one’s own fruits and vegetables took pressure off of farmers, canneries and distributors as well as freeing up more food to be shipped overseas. This collection of books is one of my personal favorites. They provide a glimpse into a part of American History that is often overlooked. I find it fascinating to see how our foremothers managed their households with the extra stresses the war provided. It makes my own minor struggles pale by comparison. There are also some tasty and economical recipes, that can still please the palate and the pocketbook today, as well as they did 100 years ago. Most of these books were published in 1917 or 1918. Awesome recipe links! Thanks! I saw some lady and she lost like 100 pounds on a WW2 ration diet! It was a cool video somewhere. Wow, that is so cool. If you remember where you saw it, I would love to watch it. I’m glad you’re enjoying the links. Thank you, Maggie! Did you know there are antique books of cookery that have been turned into free legal audiobooks at librivox.org?t I’ve been surprised how well older cookbooks and housekeeping manuals do as audiobooks. How cool is that? I had no idea Joy. Thanks. I will look into it. I’ve used librivox for girl’s novels and for the boys for homeschool, but never even thought to look for cookbooks or housekeeping manuals. That is just so cool. They are so much fun. Sometimes they are just plain inspirational, even if I don’t find recipes I want to use.